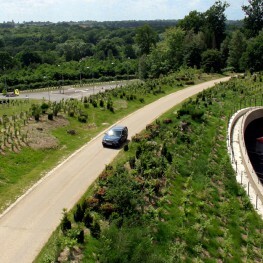 The land bridge across the A21 Lamberhurst Bypass connects the historic approach from the gatehouse to the house and gardens of the National Trust’s Scotney Castle Estate, in the Weald of Kent. 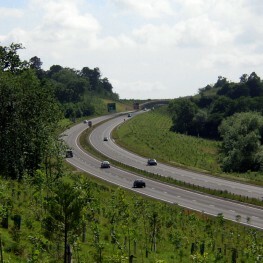 The densely planted, green bridge spans approximately forty-metres over the new dual carriageway and was designed to ensure that the existing woodland along the ridge stretching east to west across the Area of Outstanding Beauty was not interrupted by the construction of the new road. 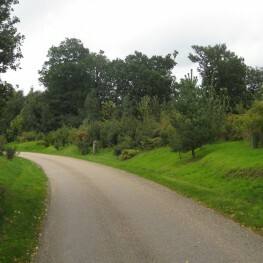 It also recreate the historic parkland so as not to interrupt the quality of visitors’ experience and the picturesque landscape as they approached the house. 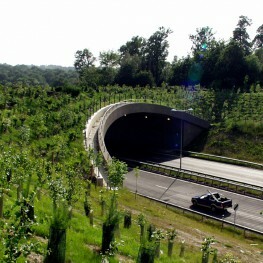 Habitat conservation was of great importance so we introduced planting to connect the fragmented habitat areas of the local dormice population. 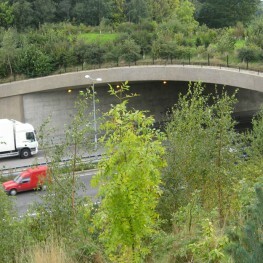 Featured as exemplar project in Highways England's guide. 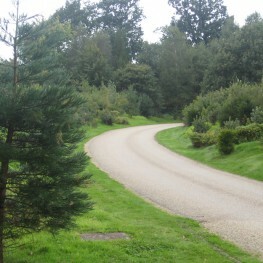 "The road to go design"